The Past, Present and Future of Canada on a Stunningly Symbolic Piedfort! It doesn't matter whether you're one person or an entire country -- birthdays are a great time to take stock of where you've been, where you are and where you're going. To celebrate Canada's 150th anniversary in 2017, we can't think of a better way to do all three than this gorgeous Timeless Icons Silver Piedfort Proof. Combining two unifying and illuminating symbols of Canada, this brilliant artistic statement both cherishes the past and looks forward to a hopeful future. 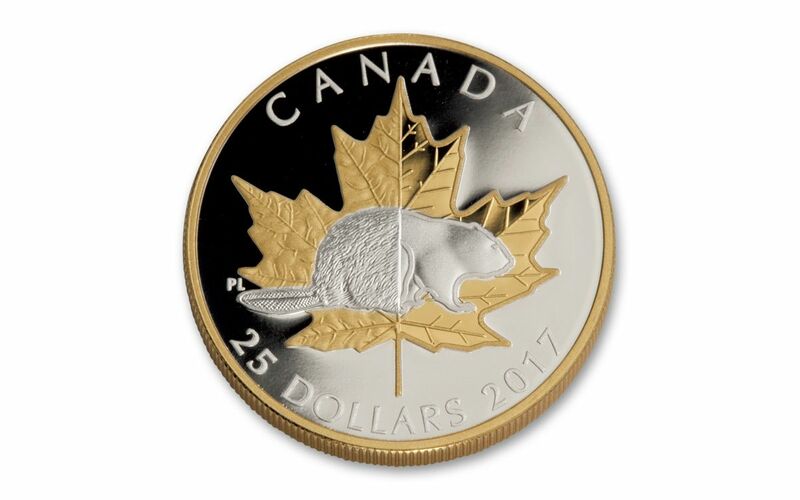 150 YEARS OF HISTORY, ONE POWERFUL DESIGN -- The beaver, symbolizing Canada's first economic bedrock, and the maple leaf, icon of natural beauty, growth and renewal, are minted front and center. But look from left to right, and you'll see a distinct transition between lush, realistic detail (characterizing the past) and modern, artful minimalism (representing the future). 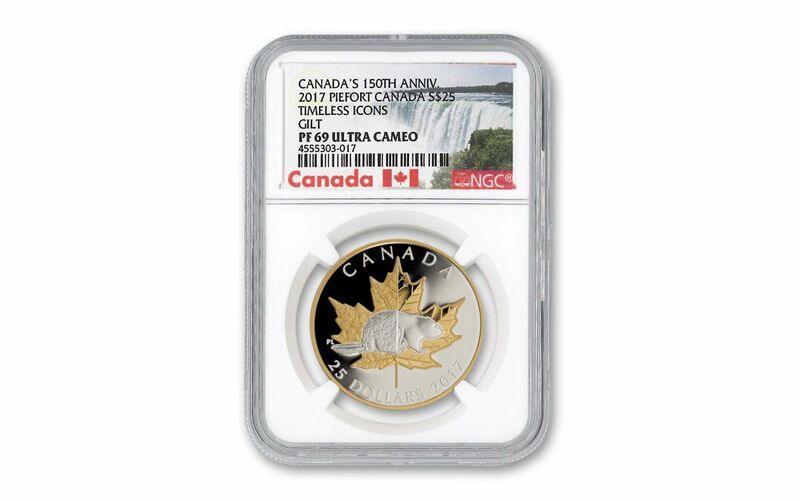 A TRUE "PROOF" OF CANADIAN CRAFT -- Beyond this coin's world-class design, this gorgeous coin is proof-minted in one ounce of highly-pure 99.99% fine silver. The artisans at the Royal Canadian Mint use hand-selected planchets, multiple strikes and polished dies to produce coins with sharp detail and mirror-like fields. NOT JUST A PIEDFORT, A CANADIAN FIRST! -- That's right! This proof is a piedfort, meaning that it's twice the thickness of a standard coin. 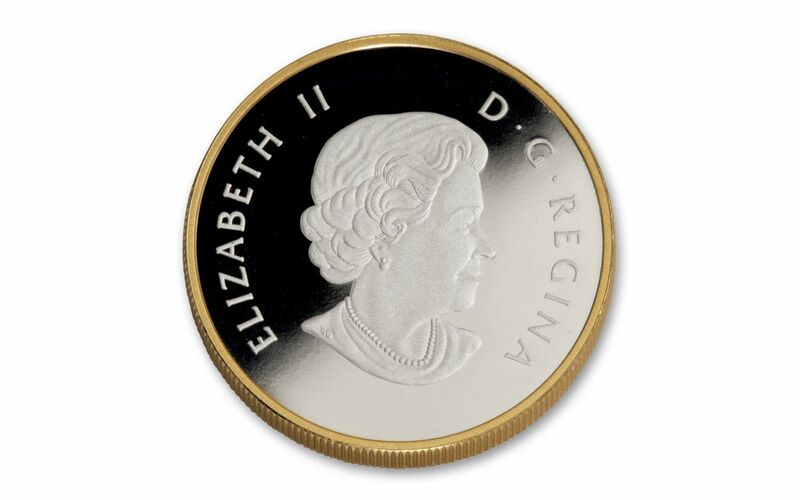 Not only that, the Royal Canadian Mint has added selective gold plating on both the reverse's maple leaf design and the coin's edge -- a FIRST for a Canadian silver piedfort proof! CANADIAN LEGAL TENDER -- Each Timeless Icons Piedfort Proof is 25 dollars Canadian legal tender, a fact reflected on the reverse along with the beaver and maple leaf design. Flip this piedfort proof over and you'll find Susanna Blunt's most recent profile of Her Majesty Queen Elizabeth II. CERTIFIED NEAR-FLAWLESS -- In addition, your piedfort will come certified Proof-69 Ultra Cameo (PF69 UC) by Numismatic Guaranty Corporation (NGC), a distinction that means your almost-flawless Timeless Icons Piedfort Proof will showcase an impressive full strike and indistinguishable imperfections. In addition, your proof will be sonically sealed in an acrylic case -- giving you the best in protection while granting clear sightlines into every beautiful detail. SOLD OUT AT THE MINT! 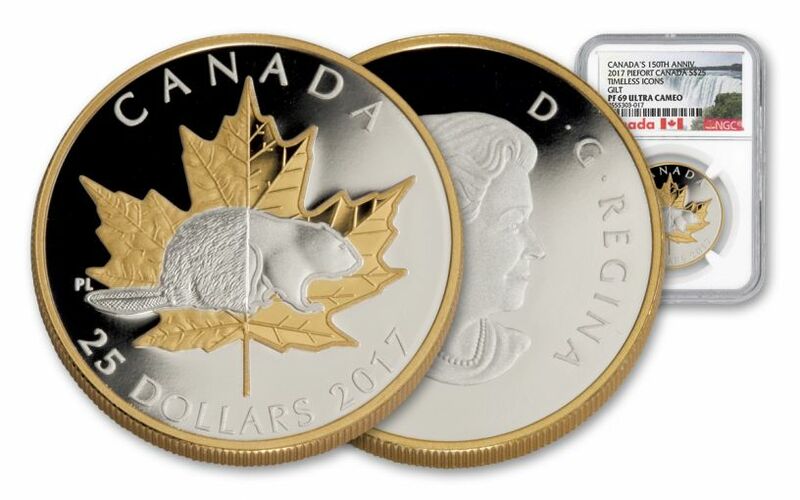 -- According to the Royal Canadian Mint's website, the entire 7,000 piece mintage of the Timeless Icons Piedfort Proof is completely sold out! Whether you or someone you love is a Canada fanatic, a coin collector or just someone who loves great symbolic art, this piedfort proof is as sure of a thing as bottle of Maple Syrup in a Montreal pancake house. Don't wait another 150 years -- get your Timeless Icons Piedfort Proof today!